Strangely, happened after I visited mSO and complained about SO flinging their crap in our direction, but that's got to to be just a coincidence, right? Just like serial upvoting, serial downvoting is detected and reversed. The last time I looked, the reversal was done daily, shortly after midnight UTC. There's a vote-fraud detection algorithm that runs once (twice?) a day and will reverse those votes assuming that it's actually all from the same person - which seems pretty likely given the time frame. Don't worry about it. There are scripts in place to detect and reverse downvoting of that extent. (and it's not exactly subtle is it?) Check back again tomorrow and you'll see all the numbers back in green with "Serial Voting Reversal". What the auto-script looks like and does - reverses the points on the next day. Seems somewhat exploitable. Retaliation for my posts here on meta? 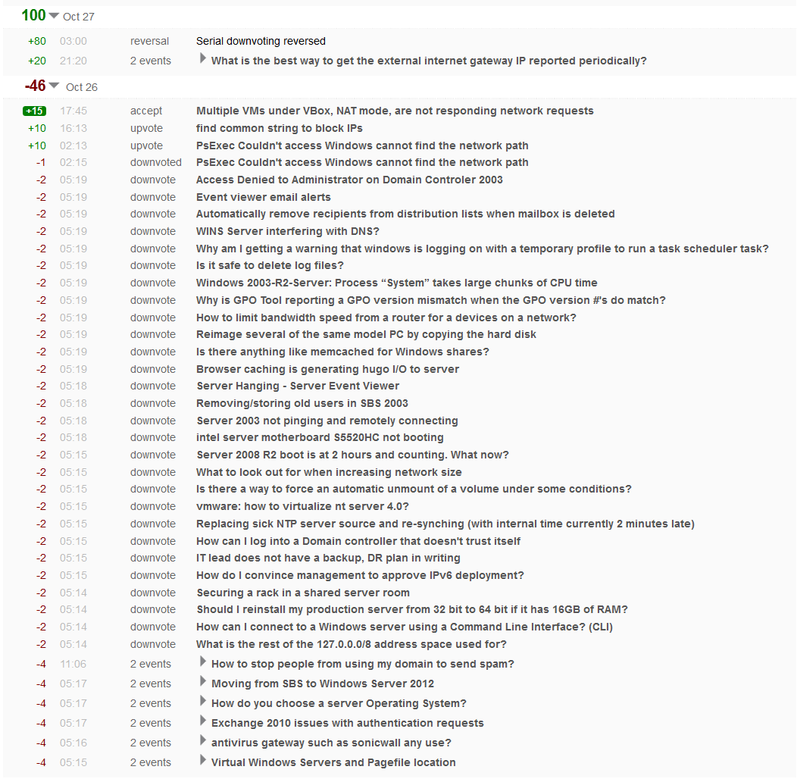 How are our questions indexed/googlable so fast? Is this post really spam or offensive?